When B-Grade Sci-fi meets the Circus you get THINGS not of this EARTH! The National Institute of Circus Arts' (NICA) graduating students present this year's showcase THINGS not of this EARTH. NICA is one of only eight national arts training institutes in Australia, and offers the only Bachelor of Circus Arts in the country. Each year, NICA graduates perform a choreographed show in-front of a live public audience. Shows take place at NICA's premises, on the institute's very own stage. NICA's 2016 Showcase: Things NOT of this EARTH sees fourteen budding stars of the circus perform their amazing skills in a brilliant show. Things NOT of this EARTH takes inspiration from B-Grade Sci-fi movies. With a nod to retro movies of yesteryear, this is a show that takes you on a journey back in time and propels you forward to 2016 all-at-once. There's a hair-dryer lazer-gun, a strange being from another planet manipulating planets with his hands and forehead, an aerial contortionist in drag, a lady-in-red foot juggling parasols in a giant martini glass, a body-popping robot, spinning in the Cyr wheel.. but that is not all. A special mention for, in my humble opinion, the stars that shine bright (although really, the entire ensemble is just fabulous). Lachlan performs an effortless umbrella and hat scene on the Chinese Pole, which could be mistaken as a modern day circus-esque 'singing in the rain'. 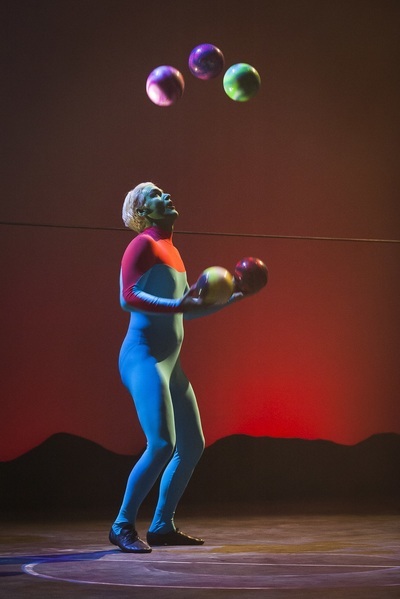 Hugo's smurf-lizard like character, cleverly spins 'planets' while clowning around the stage in his blue leotard. Not only is he hilarious, but remarkably skillful. 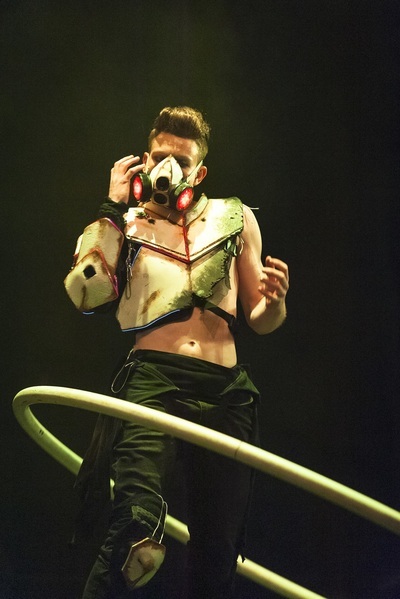 Leigh Rhodes is noted not only for his impressive skills in the Cyr wheel (a single metal circle inside which the performer stands and does tricks), but also his impressive body-poppin' moves. A big thumbs up to NICA's stage designers, too. In the second half of of the show, the city backdrop falls to expose the rest of the stage and the troupe in a group ensemble finale; definitely one of the highlights. THINGS not of this EARTH is a circus show, but not as you know it! 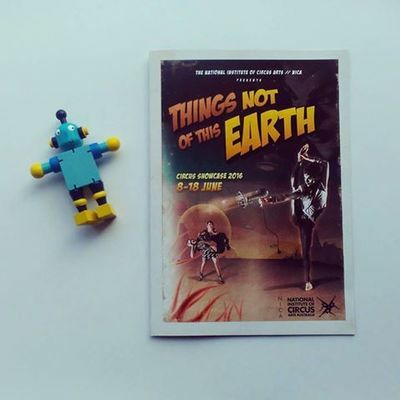 THINGS not of this EARTH has an interesting and eclectic soundtrack, each chosen to compliment the act. This is a show that is not only packed full of talent, but has plenty of WOW factor, and is a ton of laughs, too.